Top 5 craziest red cards | When players go the extra mile. World Cup have is known to give us memories we never will forget. Most of them are wonderful goals, great stories or memorable celebration. But there have also been some crazy red cards, where players just switch their brains off and goes in for the game-winning tackle, if you can call it game-winning to get a red card? 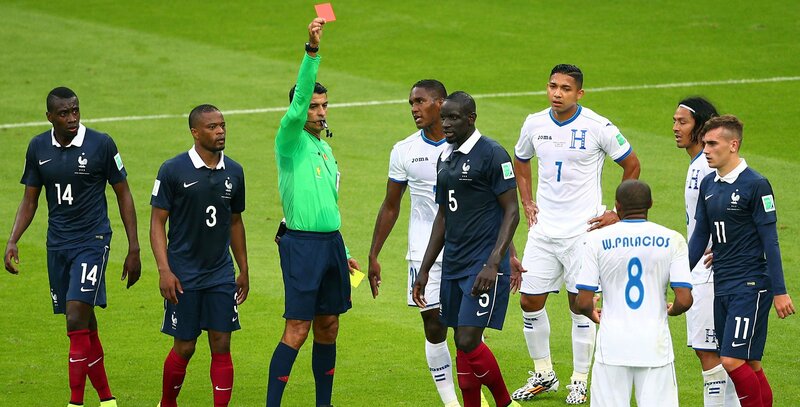 Throughout the history there has been 169 red cards in total in all World Cups since 1930. If we do some quick math that’s approximately 7,6 red cards per World Cup, with 20 of them being dealt out at the 1998 World Cup in France, a classic World Cup if you look from a defender’s point of view. You don’t usually connect Brazil with red cards. But in 1994 Leonardo lost his head a bit and elbowed Ramos from the United States in the face. It was the round of 16 and in the last couple of minutes of the first half there was an intense battle for the ball. Ramos tried to nutmeg Leonardo, which he obviously was to smart to avoid. But Ramos pulled his shirt a bit too much which caused Leonardo in sticking him an elbow and a ticket to the hospital with a skull fracture…ouch. This guy is known of collecting some red cards for the Serbian team (in the 2006 tournament they participated as Serbia and Montenegro). While already being behind 3-0 Kezman seemed like he wanted to get an early shower with his tackle on Mascherano. After some casual tiki-taka play from Argentina, Kezman suddenly appears in the picture with a full scissor tackle. The game ended 6-0 for Argentina, and Serbia and Montenegro got knocked out with 0 points in the group. This one might be one of the most talked red cards in the World Cup. The Danish referee Kim Milton didn’t really hesitate to make his mind up that this was a red card. After a battle for the ball Diego Simeone fell over David Beckham, while pressing him to the ground. The fan favourite, Beckham, didn’t really felt this was okay, so tripped with his leg which meant he went out. Not the most dangerous thing seen on the pitch, but was it a red card at all? On the second place we find another of the most talked red cards in the history of World Cup. This might just be crossing the line for what fair and not fair. Well Luis Suárez isn’t actually known of being the fairest play player with all his episodes in football. But could you argue for not doing this if you knew it will give your team another chance for advancement? No matter what the famous hand episode and his ‘joyful’ celebration in the tunnel after the missed penalty gives this red card the second place. Everything is extra heated when it comes to a World Cup final, and it seems that just every player on this planet can have an off-day and almost K.O. another player. This was the case when Zidane made the headbutt no football fan will ever forget. There has been many theories on what happened between Zidane and Materazzi in those few seconds, and some rather not kind words about Zidane’s sister switched Zidane’s brain off and he went full MMA on Materazzi. This was our Top 5 crazy World Cup red cards. Hopefully we aren’t going to see as crazy red cards at the 2018 World Cup. But what’s a World Cup without a fight for the Trophy?